Untitled (It’s almost a one-liner), created by Sarah Beck and Shlomi Greenspan, is a multi-media installation that explores the ambiguity of a performance about to begin via an empty stage. On the stage, a microphone sits next to an answering machine on a stool illuminated by a spotlight. Mounted on the wall behind the mic is a neon sign. After a moment the answering machine begins to play a series messages. 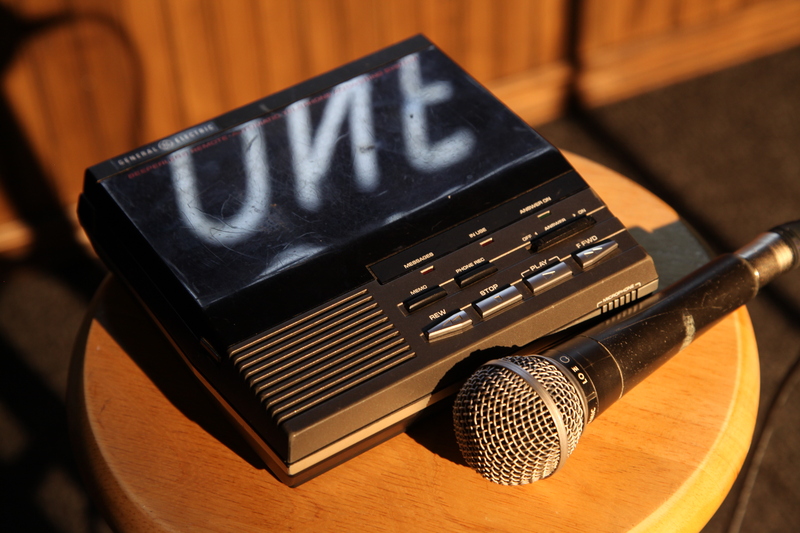 Referencing the work of Andy Kaufman, a ground breaking comedian who straddled performance art and comedy, the answering machine delivers the performance in lieu of the performer. Unlike Marina Abramović, the artist is not present. Untitled (Itʼs almost a one-liner) is meant to be beheld as an object, a spectacle in its own right. The work is mechanized, delivering its own performance. In Untitled (Itʼs almost a one-liner) comedic material becomes the material of the artwork. The installation cultivates expectations and then subverts them; waiting for a punch line is, in fact, the punch line of the work. Untitled (Itʼs almost a one-liner) debuted at Hamilton’s Supercrawl in 2013. Hamilton Arts & Letters Magazine published an insightful article by Paul Rocca. We then showed it at Ottawa’s Nuit Blanche and at Sydney’s Lumière. In 2014 it was one of six works which consider the theme of humour in public art in Out of Site, curated by Earl Miller, for Toronto Nuit Blanche. The work was then on display at The New Gallery in Calgary, and was accompanied by an essay by Sky Goodden you can read here. Also, The Calgary Herald’s Swerve Magazine recommended our show and featured an interview with us by Craig R. Palmer. It was most recently on display at the Harcourt House in Edmonton during the spring of 2015. The Edmonton Examiner has a story by Doug Johnson you can read here.